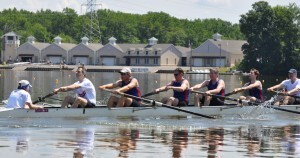 Bring your team to the PNRA Caspersen Boathouse, a US Olympic Training Site and a home to the US Olympic Rowing Team! Spend an exhilarating day on the water: working in unison, side by side, for one common goal…. Build your team with us! Transportation: Coordination to/from the Caspersen Rowing Center, Mercer County Park, NJ. Greeting: Upon arrival, participants will be greeted and toured through the boathouse by current or former US National Team Members. Experience on the water: Teams will move boats into the water, learn to enter the boats and get out on the water for a race experience. Catered Meal: After exciting moments on the water, participants will enjoy a relaxing meal catered to their preference. Olympian Experience: A US Olympian will speak with the group for 10-15 minutes and share with them the medals that he/she earned. Photo session: Group photo with current or former US National Team members and their medals and individual photo.